Richard Krauss is the editor and designer of Larque Press’s The Digest Enthusiast, which has appeared twice yearly since 2015. In today’s post, associate editor Jackie Sherbow talks with Richard about his work and the world of digest magazines. Find out more at the Digest Blog—and you can purchase all issues of The Digest Enthusiast here. Richard Krauss, portrait by Joe Wehrle, Jr.
AHMM: Please tell us a bit about yourself. You’ve worked as a designer, marketing strategist, artist, and cartoonist. How did your interest in digests develop, and has that relationship changed over time? Richard Krauss: AHMM is a long-time favorite, so it’s quite an honor to be here. I’d always read crime fiction, but Geoffrey O’Brien’s reference book Hardboiled America opened the floodgates to 1950s era paperback originals for me. The novels by these crime writers were too seductive to resist. Soon, I found these same authors wrote short stories for digests, by then the preferred format for fiction magazines. There were hundreds of titles—Manhunt, Jonathan Press, Pursuit, and of course Alfred Hitchcock and Ellery Queen, to name just a few. Collectors D. Blake Werts, Rob Imes, and I were chatting one day via e-mail about digests. As the brainwave to document them dawned, The Digest Enthusiast was born. Every potential contributor asked was eager to help: artist/writer Joe Wehrle, Jr., magazine historian Tom Brinkmann, author Lesann Berry, illustrators Michael Neno and Larry Johnson, cartoonist Bob Vojtko, and Hugo award-winning artist Brad Foster. Once the first couple of editions were out, our circle grew to include writers like Steve Carper, Peter Enfantino, and Gary Lovisi—and our contributor list grows with every new edition. 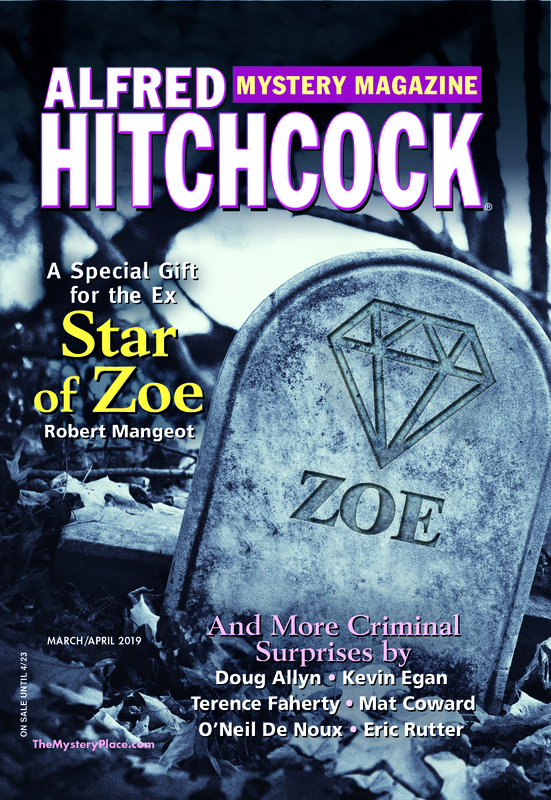 My passion remains crime fiction, but working on the magazine expanded my interest in all genres of fiction, and even nonfiction titles like True Crime Detective, Fate, and Exploring the Unknown. AH: Each issue of The Digest Enthusiast is full of a wide variety of content, from interviews to reviews (in many genres) to poems, artwork, and features like “Opening Lines.” What guiding principles help you maintain focus? RK: Our purpose is to explore the diverse world of digest magazines. We cover all types of genre fiction digests and select nonfiction titles. Variety is essential. We want something for everyone, every time. We even include a few short stories. After all, fiction is what draws most readers to digest magazines in the first place. Much of our content is a look back, but we also report on the current scene. Recently we started a column called “News Digest,” which includes all the late-breaking industry news we can gather as each issue enters final production. We present cover previews and news about the four Dell digests, F&SF, Nostalgia Digest, Fate, and the new generation of digests, mostly made possible by today’s publishing technology—Pulp Literature, Paperback Parade, Weirdbook, Switchblade, Mystery Weekly, Betty Fedora, and many others. AH: And what motifs and themes do you see across the variety of digests? RK: Editors like Ellery Queen, Ray Palmer, Robert A.W. Lowndes, and H.L. Gold were as important to their readers as their magazines. Publishing a genre fiction digest has always been challenging. The editors, artists, and writers that create them love what they’re doing, and readers know it. Readers want that affinity for their favorite writers and their stories and characters. You expect crime and deception from a mystery digest; new ideas and concepts from a science fiction title. But with a closer look, you’re struck by the unexpected, and energized by the unbounded creativity in digests. For example, Robert Arthur’s Mysterious Traveler digest, with every tale hosted by the title’s namesake. In 1981, Mike Shayne Mystery Magazine had flash fiction from Robert Lopresti before flash fiction was labeled. B.K. Stevens’ epistolary approach to her Bolt and Walt series for AHMM—and the inclusion of Dale Berry’s seven-page comic story earlier this year. Get a digest and get enthused. For writers, these days, it’s all about platform. Most successful digests also leverage platform. Alfred Hitchcock, Isaac Asimov, The Man from UNCLE, and The Saint were all well established names/brands before their digests debuted. In 1953, Manhunt began serializing a brand new novel by Mickey Spillane, at the height of Spillane’s popularity. Manhunt sold over half a million copies of their first issue. In 1948, the UFO craze seized America. Fate Magazine debuted with Kenneth Arnold’s account of his famous 1947 sighting, catapulting Clark Publishing into success. Slow and steady only wins if you can afford to stay in the race. Otherwise, better to hitch your wagon to a proven platform. AH: Can you talk a bit about the relationship between visual elements and copy in your favorite digests? RK: You judge a book by its cover—or more precisely, you form your first impression from a book’s appearance. The cover is primary, but you react to the whole package. How does it look and feel? Digests have an inherently appealing size, easy to hold, easy to carry, and inviting to read. Some fiction magazines use the same fonts for every story title, intro, text, and notes. Others vary the titles using different fonts to reflect the feel of the story to come. The text font is probably unconscious to many readers, but the magazine’s designer has given it a lot of thought, trying to balance all the options in style, size, weight, leading, and line length. If the budget allows, an illustration can spark interest in a story in a heartbeat. The best are custom-made, depicting a scene from the story, or perhaps the overall feel of its milieu. Digest collectors follow their favorite artists as often as their favorite authors. AH: What observations do you have about the community of digests enthusiasts (collectors, artists, writers, fans, etc.)? RK: The community is as friendly and welcoming as you could ever want. Writers and editors, reviewers, contributors, collectors, and readers—they’ve all been enthusiastic and energizing. Just a terrific group of people, sharing and celebrating their common interest, a love for compelling fiction and artistry. AH: What are the top three things you wish everyone would know about digests? RK: First, they’re a bargain. Probably no surprise to AHMM readers, but digests offer the best, most affordable short story writing available. Online, at your local newsstand, or by subscription, there is no better fictive bang for your buck. Finally, there are hundreds of terrific digest magazines available. Whether you want a new adventure or a new passion, digests are easy to find online, highly collectible, and more affordable than just about any other type of magazine. AH: Are you working on or planning any other projects? RK: Writer and filmmaker, Alec Cizak, published of one of the earliest digests to leverage the new publishing technologies, Pulp Modern. After a year hiatus, he and I teamed-up to revive the title and released our first new issue from Volume Two in May 2017. The next Pulp Modern will be out late this year, near the same time as The Digest Enthusiast #7. I’m also working with Marc Myers on a collection of Clark Dissmeyer’s comix work from the 1980s, which will be released this fall. I don’t believe that John D. MacDonald started in the digests. He had quite a few tales in the pulps before he submitted to digests. Great interview–thanks, Richard and Jackie! And I loved doing an interview with Richard for the June, 2017 DIGEST ENTHUSIAST. It was fun to look back on the stories I’ve written for AHMM–it brought back lots of memories. And when I got the issue, I found many of the other articles fascinating, too.